Once a month I head over to Ralphs Wine and Spirits in Hingham for a pizza-making and wine-pairing class. The classes are a blast! I make pizza with chef/co-owner Kim and her husband/owner Ralph, pours the wine. I get to show off the Baking Steel and enlighten the guests as to why they will no longer need a pizza stone while cranking out pizzas and enjoying great company. The wine shop has a small kitchen set up with one oven. There is room for about 16 people to join us each session. It's not necessarily a dinner, just a fun night out with friends where hopefully, the guests learn some things about food and wine. In our case, pizza and wine. Having one oven and 16 mouths to feed, is not exactly a walk in the park. So, planning is key. I usually arrive a couple of hours ahead of the 2+hour class, to prepare our mis en place. As our guests arrive, I put together a few, fresh-from- the-oven, stromboli to sample. Then off we go to the pizza making! We usually construct three of three different pizza's. That way everyone can taste the same flavors as each different wine is poured. During our last session, Chef Kim wanted a menu change. Tomatoes and corn are in-season and she had some beauties! The colors were so perfect and really "popped" on the pizza! In a class with 16 hungry clients, I don't get much time to enjoy the pizza's myself. 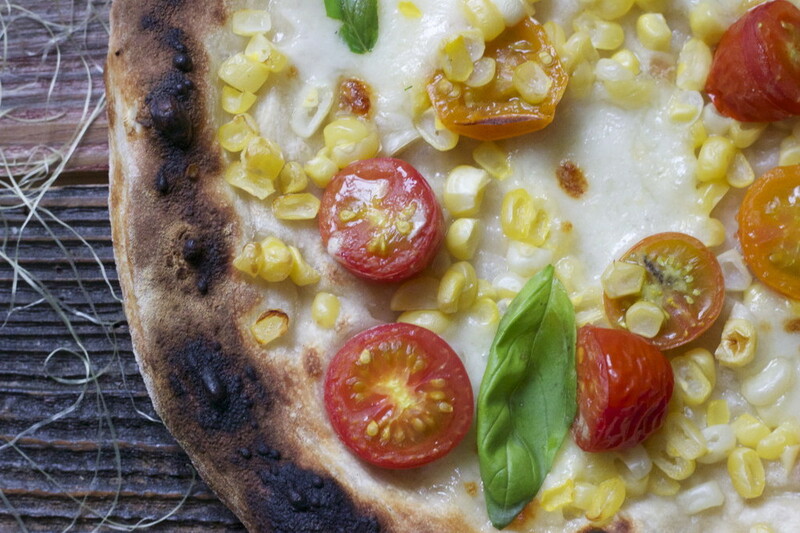 Don't get me wrong, I sneak in a slice here and there, but this tomato/corn pie was devoured! Not even a crumb left for the hired help. I couldn't get those colors/flavors out of my head, so I decided to re-create this pie in my own test kitchen. 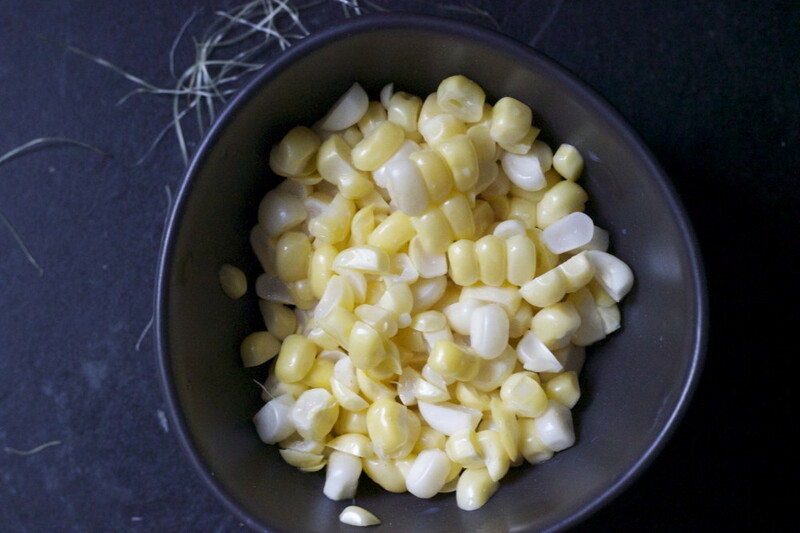 I bought more tomatoes and corn and headed back to the test kitchen. Now I know why it went so fast! 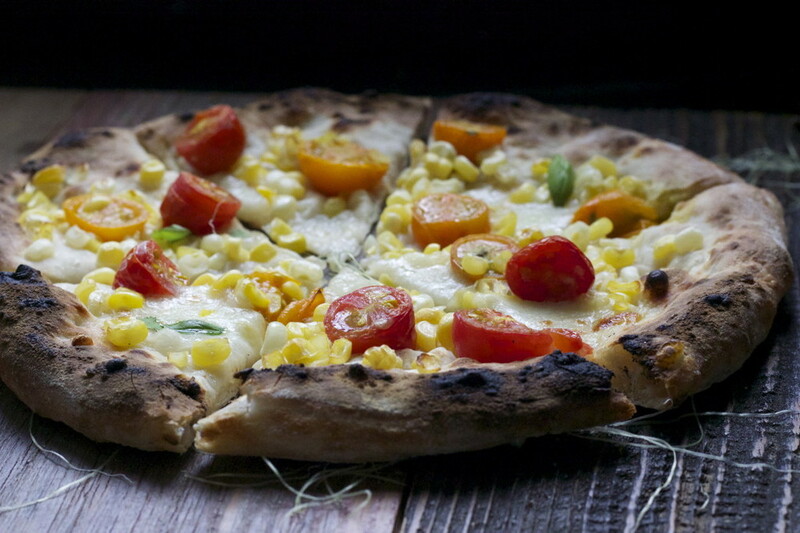 It is a perfect summer pizza-sweet with a bit of acidity from the juicy tomatoes. Very simple, very balanced and very delicious! Lets create some love for fresh summer ingredients! 1. Place Baking Steel on top rack of your oven. Pre-heat to 500 degrees on convection. (Preheat 45 minutes-1 hr). 2. Stretch or roll out dough to a 12 inch cylinder, or any shape will do. Lightly flour your peel and place dough on top. 3. 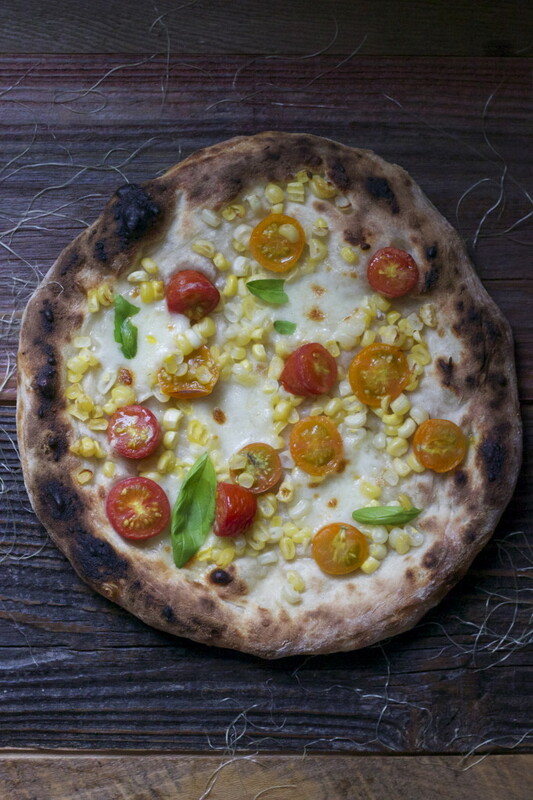 Evenly distribute fresh mozzarella, corn and tomatoes leaving about 1 inch around perimeter. Less is more. 4. Launch onto the Baking Steel, bake until you've reached your desired brownness. 5. Remove pizza from oven, add fresh basil and top with sea salt.